‘Reading, speaking, and listening’ is the triadic core of this all-in-one activity – and I wish I’d known about it sooner. I Have – Who Has activities are very simple, easy to set up, can be played with just about any age or grade level, and importantly, can be played again and again as students progress. They’re perfect for centers or a whole class exercise, as a warm up and a cool down activity. The topic is interchangeable and, what I’d like to show you in this post, can be extended to get even more out of the game. I use this activity not only for lessons learned from my textbooks (see my last post), but also extra vocabulary that can only be practiced through games and activities – like flags, sports, or clothing. 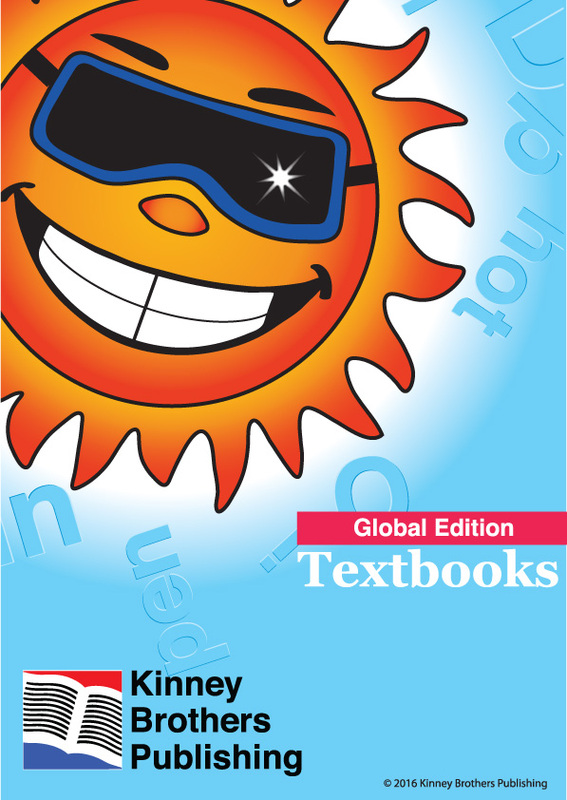 If you use another textbook series or want to create games with your own vocabulary ideas, I’ve provided a blank game template at the end of this post to get you started. Here are two very simple I Have – Who Has sets I created to get my youngest students started playing. They’re both free to download from my ESL store. I have 20+ sets available with a variety of vocabulary banks. I hope I can convince you to check them out and start playing in your own students! Again, I Have – Who Has activities are very easy to set up and play. Once students understand the concept, you’ll never have to explain it again. Simply deal the cards out to however many are playing and have them arrange the cards face up on the table in front of them. Players must be able to see all of their cards. Then step back. It’s their game. All of my game sets have designated “Begin” and “End” cards. The player with the “Begin” card reads their card first by asking the question, “Who has…?” Whoever has the next card reads their card by stating, “I have…” and asking in turn, “Who has…?” After reading a card aloud, the card is finished and turned over. When the player with the “End” card reads their card, the game is finished. Many of the game sets in my collection also have differentiated versions depending on the vocabulary bank. For example, Clock I Have Who Has has separate games for the time elements students have learned: hours, half-hours, quarter-hours, etc. 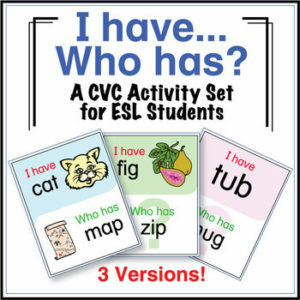 Verb I Have Who Has has three sets; one with phrasal verbs. The ABC and Phonics cards have letters and phonetic associations so you can play different games each time and challenge kids with prompts. Click on the images below to learn more about each set and download previews. You can see how the game can be adapted for a lot of Q&A practice. With the goal of getting students to use language they normally wouldn’t use in a classroom setting, you can set the sentence patterns and change them each time the game is played. I have airport. Who has restaurant? I’m at the barbershop. Who is at the fire station? I’m going to the dentist. Who is going to the hospital? I want to go to the station. Who wants to go to the bank? I went to the beauty salon. Who went to the pool? I have salad. Who has soup? I like apples. Who likes broccoli? I am eating pasta. Who is having juice? I want potato chips. Who wants cake? I have Taiwan. Who has Italy? I am in Mexico. Who is in Brazil? I went to Korea. Who went to Indonesia? I’m going to go to China. Who is going to go to Canada? Now, here are some ways to make the game walk across the room! For additional language practice, and to get the kids familiar with their cards before playing, take the opportunity to do a Q&A with each student. For example, if the game set is using verbs, ask the students questions like, “What are you doing?” or “What did you do yesterday?” As each card has two verbs, students can work in small groups or do a round-robin type Q&A. Up the ante on the game by setting a timer and having kids try to ‘beat the clock.’ Post a chart on the wall with group names and challenge classes against each other. In a usual game, a player directs their question to the whole class. This keeps everyone on their toes and listening. Try having students move amongst each other asking individually, “Do you have…” When they find their card partner, they stick together by linking arms or holding hands. Eventually, the entire class becomes one connected line reflecting the order of the game. Have students sit in a circle. The player with the “Begin” card asks the person next to them, “Do you have…” If not, the player answers, “No, I don’t.” and asks the same question to the person sitting next to them in a Q&A chain until the person with that card says, “Yes, I do.” and starts a new question cycle. Once a person reads their card, they drop out of the circle until only one player is left. I recommend holding the “End” card so students don’t know when the game will end. Have students arrange the cards in a dominoes fashion on a desktop. This will work with any set of the I Have – Who Has cards. Set the cards up like a ‘Concentration’ or ‘Pairs’ activity with the cards facing down and the Begin card facing up. The next card has to be the “Who Has…” aspect from the Begin card. Leave the matched cards face up on the table or lined up outside of the playing area. You can also play by finding random pairs. This really gets the kids thinking forward and backward as they try to find the matching cards. Before sending your kids home, distribute the cards and have the kids line up in the order of the game. Basically, they’ll have to play the game again to negotiate their place in line. Once lined up, collect the cards and send the kids home! This is so much more productive and entertaining than fifteen kids rushing the door to be first in line! You can see that these kinds of exercises will work well for any grade level or language ability, from kindergarten through adults. Please help me add to this list by letting me know how you play in class! As any ESL teacher knows, the value of a game is only as good as the language that can be practiced. I Have – Who Has activities, though not a game that ends with a winner or loser, has the potential to involve students with all the components of learning a foreign language: reading, speaking, and listening. If you want to get started making your own I Have/Who Has activities, I’ve created a pdf template to get you started. It’s free!